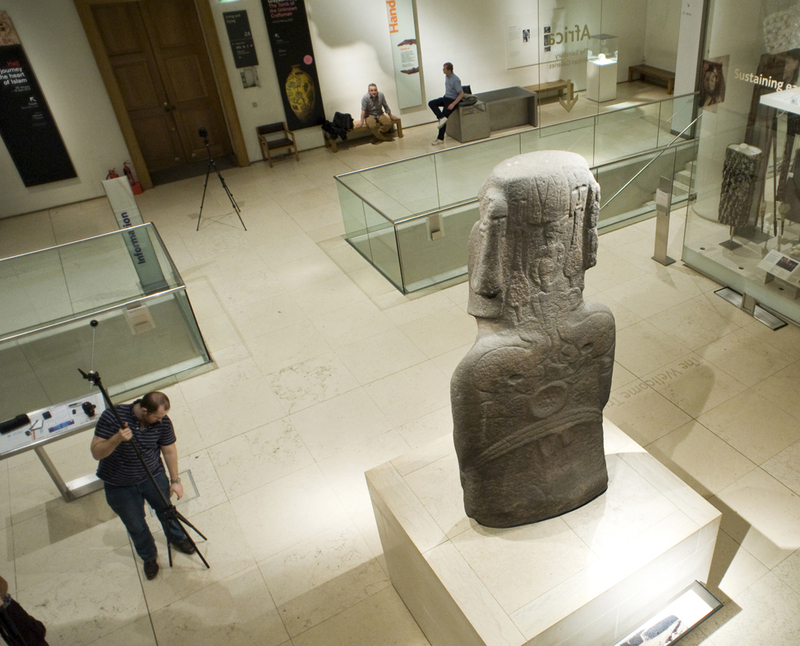 I spent last night all but alone with the British Museum’s Easter Island statue, Hoa Hakananai’a. 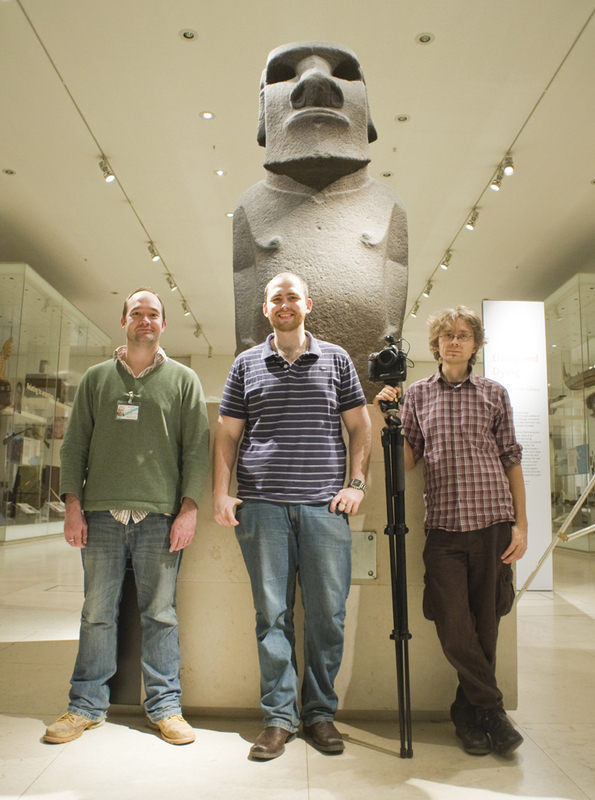 Graeme Earl, James Miles, Hembo Pagi and I began a project to record and analyse the carving in unprecedented detail. It is one of the British Museum’s most popular objects, but well known as it is, it has been little studied at first hand. It was taken from the remote Pacific island by the Royal Navy in 1868, and has been on public display in the centre of London for over 130 years, with just two significant breaks. It must be one of the most viewed statues from the island. With around six million visitors a year, the British Museum is the UK’s most popular cultural attraction at which figures are counted (only the smaller and more weathered statue displayed in the lobby of the National Museum of Natural History, Washington DC, which received 7.4m visitors in 2009, is likely to be seen now by more people). By contrast, annual visitors to Rapa Nui, the native name for the island which has a population of some 4,000, are said to have risen in recent years to around 50–70,000. 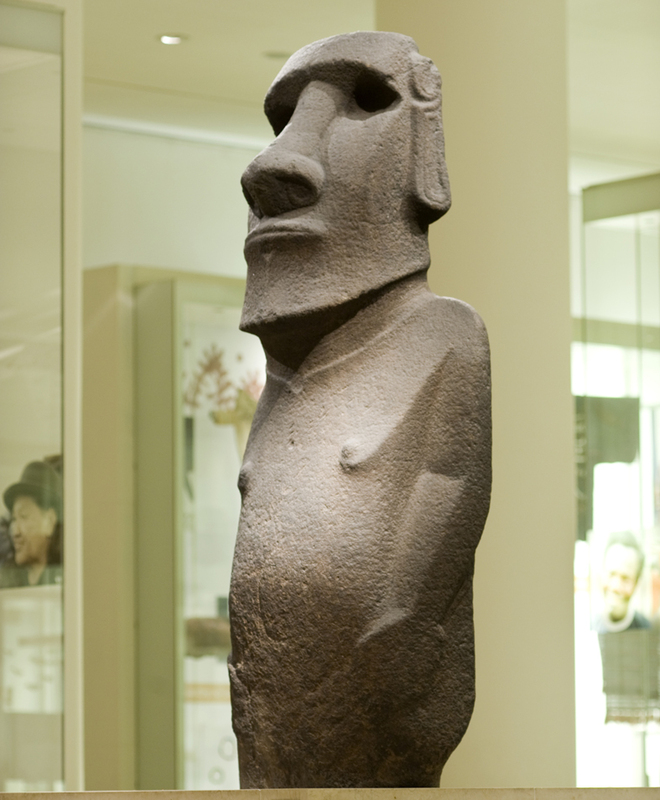 Alfred Métraux, a Swiss anthropologist who worked on Easter Island in the 1930s, thought Hoa Hakananai’a “without a doubt, the finest example of Easter Island sculpture”, and it has inspired some of our greatest artists, among them Henri Gaudier-Brzeska and Henry Moore. It was selected by Neil MacGregor as one of the 100 objects with which he told the history of the world – and in the same year, it was the target of a protest against BP’s handling of an oil spill in the Gulf of Mexico. How the statue was found and delivered to Britain is surprisingly well documented, as has been described by Jo Anne Van Tilburg in two BM publications (though the knowledge of the circumstances is particularly frustrating, as the statue was buried in deep stratigraphy that could have told us a great deal, of which there seems to be no record at all). So it is curious how little study there has been of the statue itself. We hope to rectify that by creating detailed digital images that we will make available online. That way anyone with a computer anywhere in the world will be able to see and study the statue and its carvings, and maybe find things that noone else has noticed. What makes Hoa of special interest is not only its superb preservation, partly down to the unusual use of a hard, basaltic rock, but also the presence of copious carvings on the back. These have always been known about, and photos have been available, but it was only recently since the statute was displayed in the new Great Court, and now in the Wellcome Trust Gallery, that they have been easy for everyone to see. In conventional histories of the island, most of the statues (of which nearly 1,000 have been counted) were carved in what in an European context would be largely the middle ages (perhaps AD1100–1600). Then mostly later (you might be getting the drift of this chronological point – Easter Island dating is very poorly documented) rocks all over the island were covered in petroglyphs, shallow carvings of birds, animals and abstract or symbolic shapes. This occurred, so the story goes, as part of the development of a different culture that followed social and ecological collapse (as famously described by Jared Diamond). Hoa was found by the British naval officers in the midst of a veritable gallery of these petroglyphs. It stood near a cliff that falls 300m down to the ocean, and bird colonies that were the focus of historically documented ceremonies. So the statue uniquely embodies these two traditions of art and myth, the statues and the petroglyphs. Or maybe they weren’t so separate? 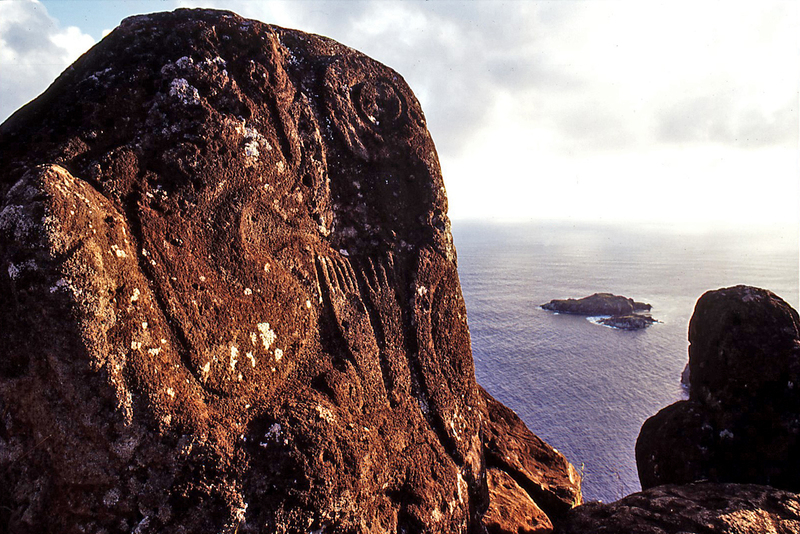 Critical analysis of the island’s archaeology has suggested to some that Rapa Nui was not colonised as early as is usually claimed. If right, this would make the era of statue carving shorter. That in turn would raise the possibility that the bird cult and the statue cult at least partially overlapped, and were aspects of a single complex of ceremony and belief, perhaps embracing the two key concepts of birth and death. Hoa Hakananai’a is an inspiring thinking tool for this debate. When we have finished the work we will all be able to see, for the first time, exactly what was carved on his back, and begin to unravel its possible meanings. We are using two techniques. The simpler is photogrammetry. For this we take photographs of the statue from different directions with an SLR camera (actually two: James took photos from the floor, and Hembo took them from above – around 500 in all). With these we can create precise 3D images of the statue, permitting digital study of its shape and morphological details. The other technique is called polynomial texture mapping, or PTM (a type of reflectance transformation imaging or RTI). This is really good at enhancing subtle surface variations at fractions of a millimetre, revealing details in objects that are all but impossible to see with the naked eye. It’s perfect for looking at those carvings on Hoa’s back. 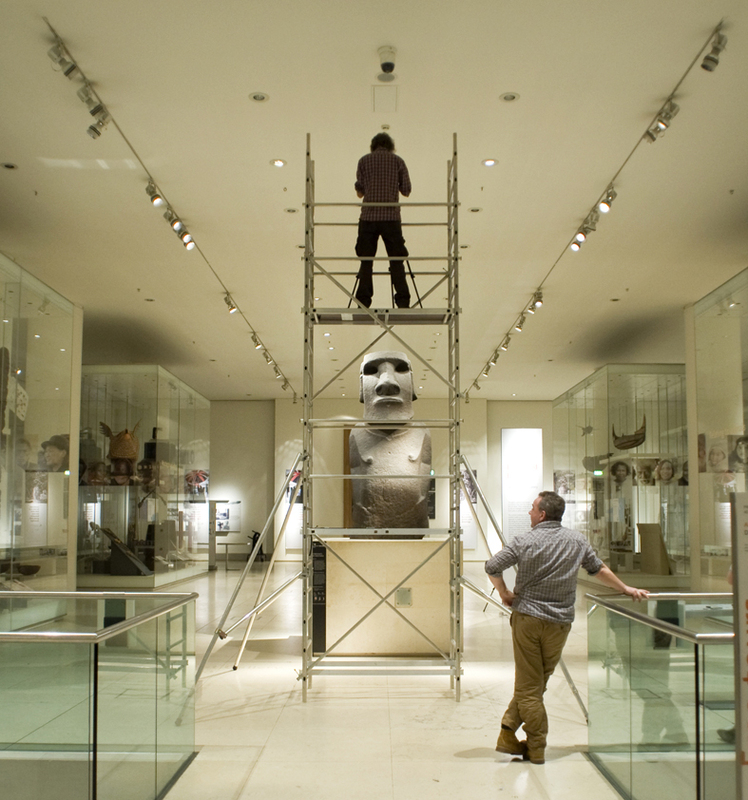 It was first applied to antiquities in 2001 – one of the earliest applications of PTM in archaeology was by the British Museum’s own David Saunders in 2004. We take a series of photographs, each lit from a different direction in the dark, and combine them with software into a special type of single image file. On your computer screen or tablet, you can alter the direction and intensity of light at will within this image, and illuminate the carvings from more than one direction at once. Derived from photos, the image shows real colours. But you can also remove this information, so that just the reflected light from the surface shows. Various forms of enhancement can be employed and features can be digitally annotated to enable collaborative study and research of the digital artefact. Between them Graeme, James and Hembo have more experience of using this technique than any researchers in the UK, and amongst the most worldwide. They recently completed a major AHRC-funded study to trial RTI on many archaeological objects, and they have already worked with the British Museum recording artefacts from stylus tablets to a Fayum portrait. And this is what they will be doing tonight with Hoa Hakananai’a. By the time we’re finished, this will be the first Easter Island statue to be so fully described. It’s so exciting to see RTI being done at the BM! When I was in college just a few years ago, I was doing RTI on petrogylphs in California. Will you be sharing the images here? We will be creating a variety of images for different purposes that we will be publishing in different ways. As I have explained, one of our major goals is to publish full RTI files that can be studied by anyone, and used to produce images unique to the user. Some of these at least we will publish online with the British Museum. I will I’m sure publish some here, and I will reference them all here. I have read other accounts that say the statue was found in a stone building in Orongo village. Does your information supersede this? You mention it was near a cliff. Do you know which way it was facing? Thank you for your help. You’re quite right, Hoa Hakananai’a was found inside a stone “house” at ‘Orongo. As far as we can tell, it was facing roughly north-east, which is away from the cliff and towards the crater of Rano Kao. That is like statues on ahu platforms around the coast, which seem to have stood with their backs to the sea, and those statues inside the crater at Rano Raraku, the main statue quarry, which face into the crater (and thus in some cases out to sea).